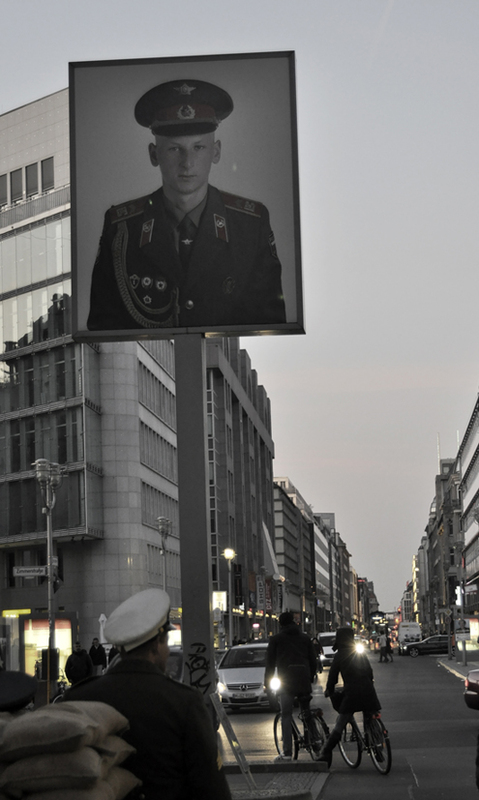 Berlin is a city on the move. Since the Wall fell over twenty years ago, construction zones are commonplace in the reunited, capital city. 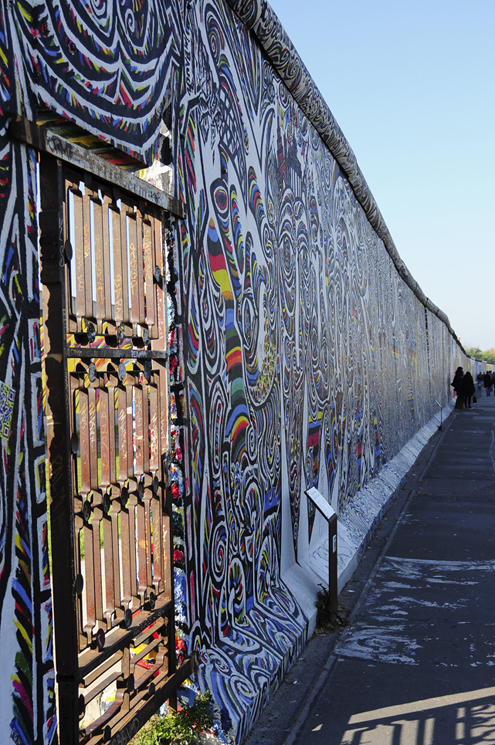 With its ever-changing landscape and its roller-coaster history, Berlin is a fascinating place to visit. 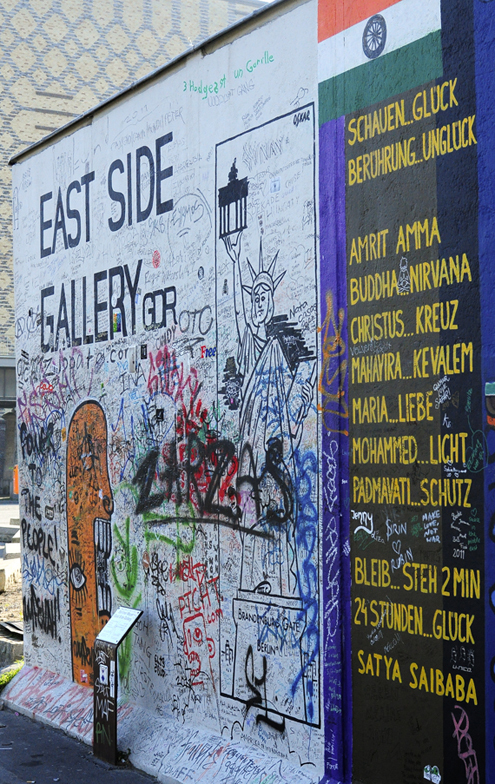 The East Side Gallery is a ¾ mile (1.3km) section of the (former) Wall covered with art and graffiti by artists from all over the world. 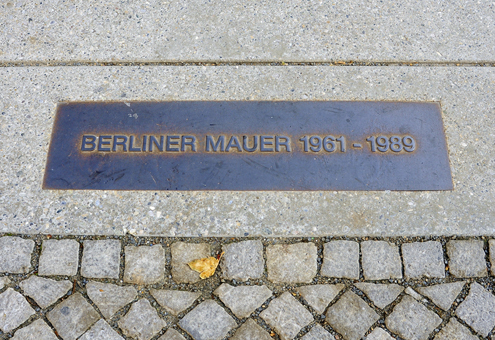 The approximately 12 foot high concrete slab once served as a dividing line between democracy and communism, but now serves as a memorial for freedom. 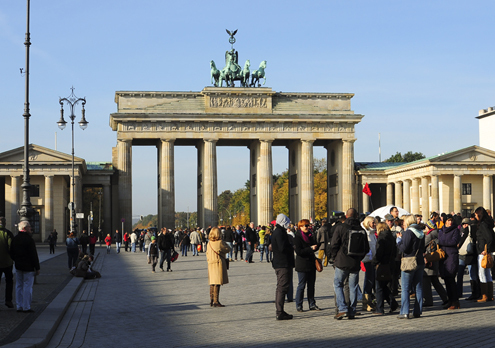 The Brandenburg Gate (Brandenburger Tor), completed in 1791, was initially used as an entrance gate to the city. 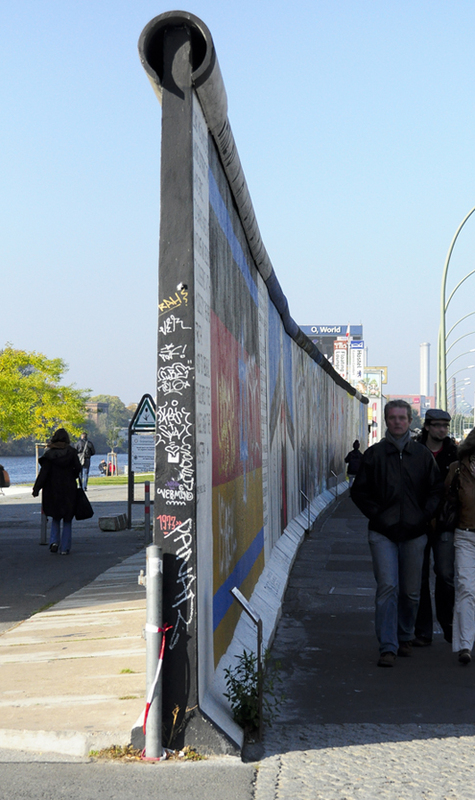 It later became a crossing point between East and West Berlin after the Wall was built. It was here, on the 12th of June 1987, during a speech in front of the Gate, where U.S. President Ronald Reagan uttered the now famous line, “Mr. 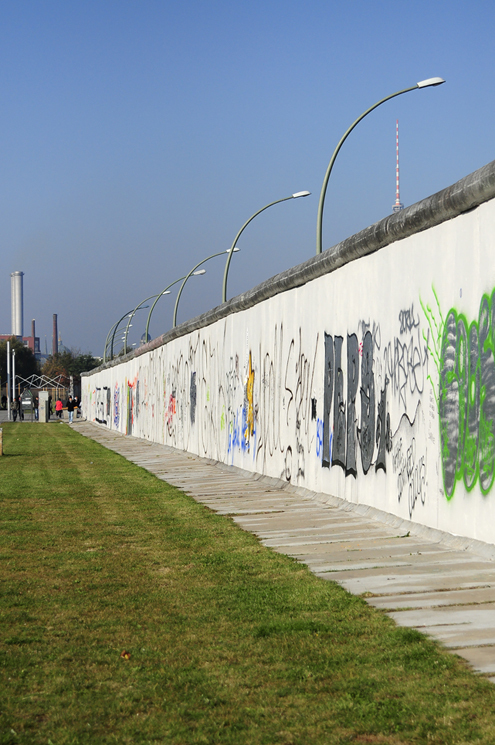 Gorbachev, tear down this wall.” Fascinating stuff. 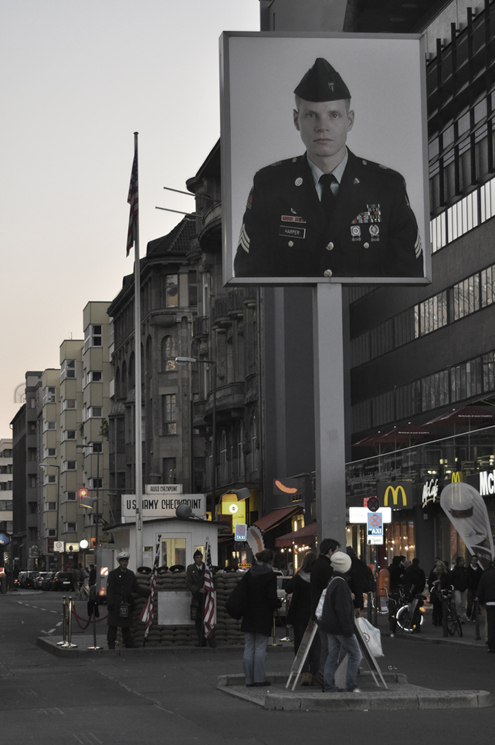 Checkpoint Charlie was another border crossing point between East and West Berlin. It was named Charlie by Western Allies, as it was the third checkpoint or “C” (as in Alpha, Bravo, Charlie, Delta, etc.). The US Army Checkpoint guard station (below US soldier photo) is a reconstruction of the original and now serves as a tourist attraction. 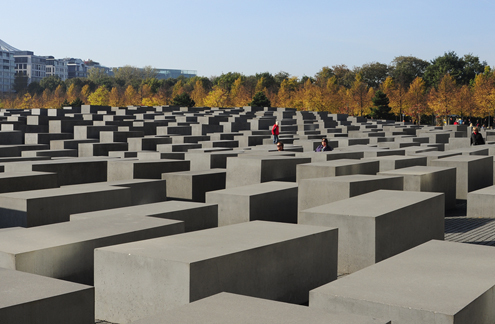 The Memorial to the Murdered Jews of Europe, also known as, the Holocaust Memorial, was designed by American architect Peter Eisenman. 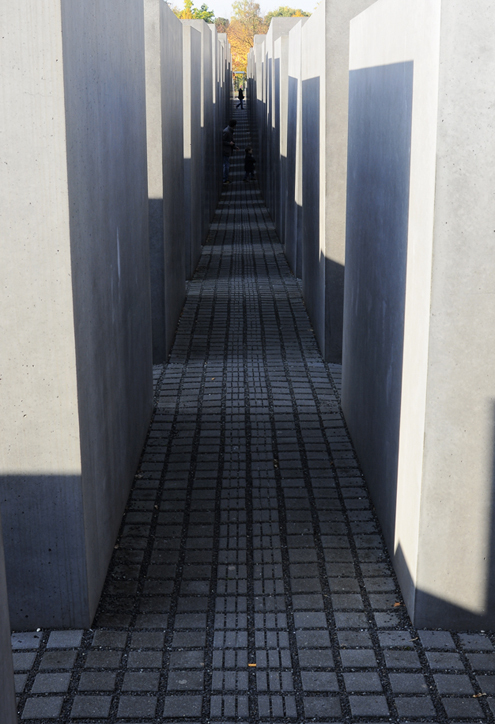 Completed in 2005, the Memorial is made up of a grid of 2,711 concrete pillars. The undulating labyrinth creates a unique perspective for each person who visits. 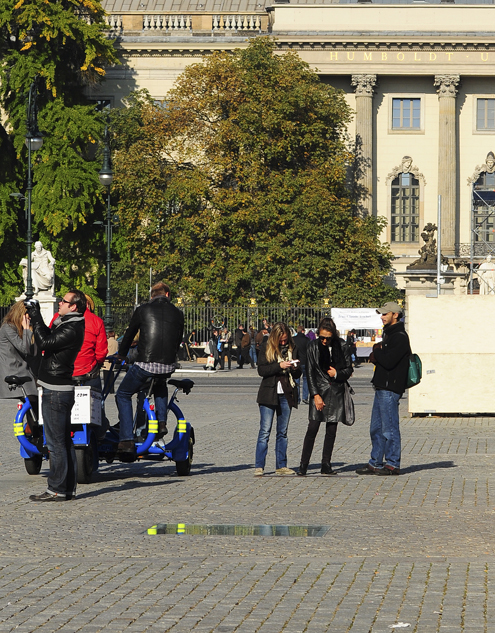 In 1933, Bebelplatz, a public square in the Mitte district, was the site of a major Nazi book-burning—around 20,000 books were set fire. 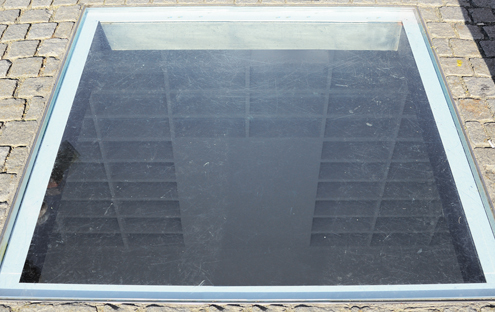 The window, in the center of the square, reveals empty bookshelves underground which serves as a memorial to this despicable act. 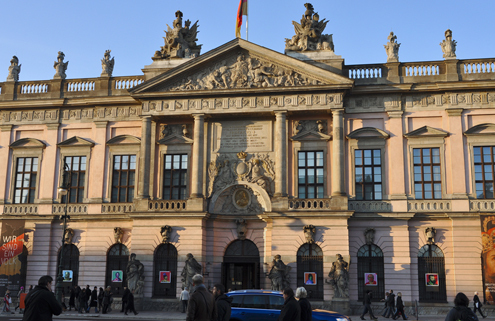 The German History Museum (Deutsches Historisches Museum) offers a fascinating look into…you guessed it…the history of Germany. From 1 B.C. to present day, this museum delivers. If you have the time (a good chunk of time), it is well-worth a visit. 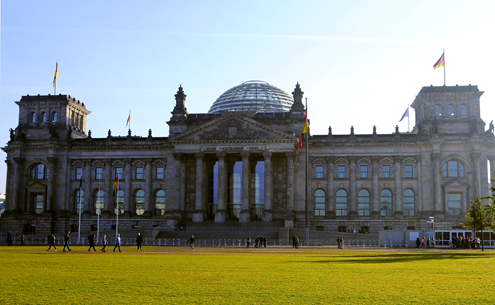 The Reichstag Building, home of German government, first opened in 1894. 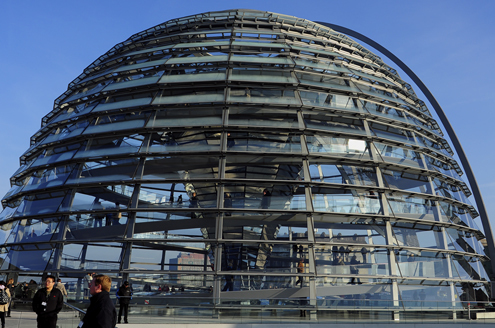 A major reconstruction in the late 1990s, by British architect Norman Foster, added a contemporary dome to the top of the building made of glass, steel, and mirrors. The spiraling ramps around the dome offer amazing, panoramic views of the city. Security is extra tight to tour the dome, so prior, online registration is required. 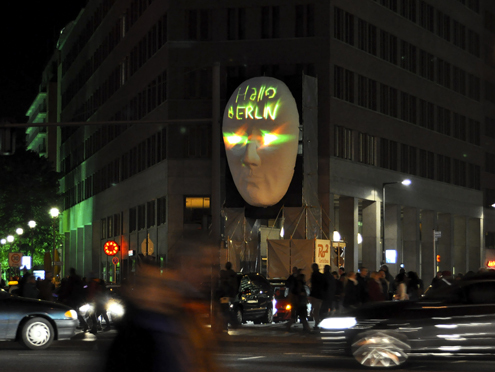 Illuminated Face in Potsdamer Platz for the Festival of Lights, October 2011. 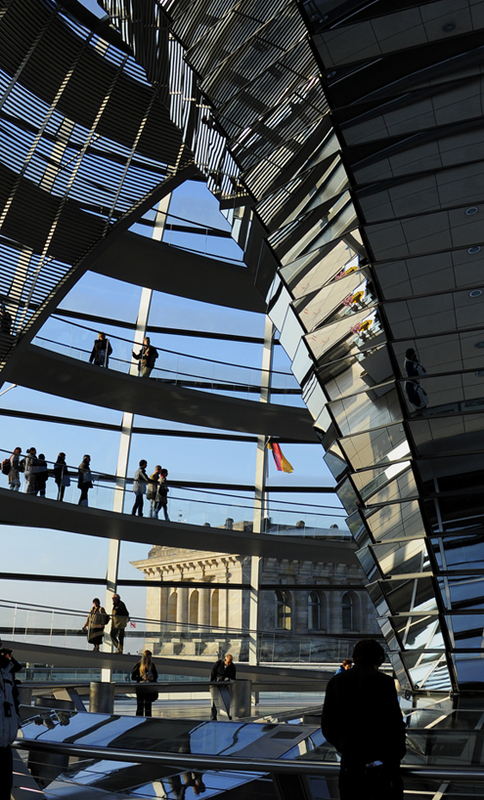 …and that wraps up our visit to Berlin, which will certainly not be our last. We had a great time and learned a lot in this historic city. We spent a night in Rothenburg ob der Tauber (not to be confused with other Rothenburgs in Germany) to continue our Christmas Market extravaganza. Rothenburg is so darn cute it seems to perfect to be real. With its cobble-stone streets and pretty, colorful architecture, it looks more like a movie set than an actual place. 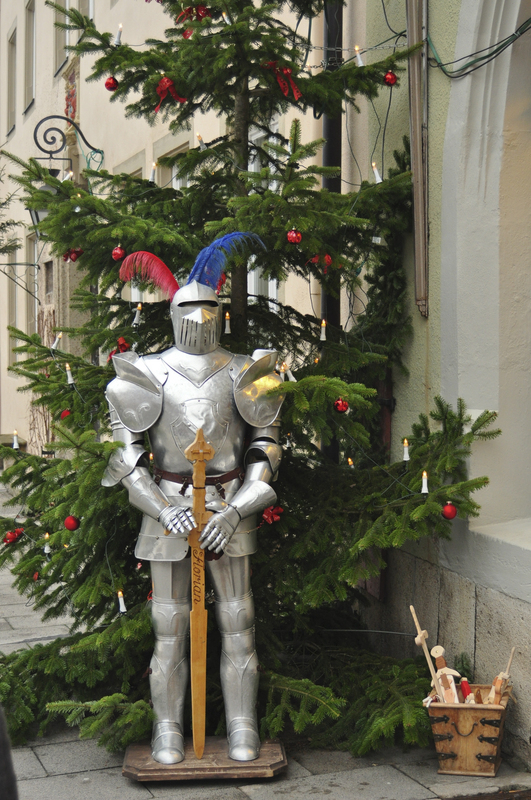 This charming medieval walled town is a favorite among tourists, especially during the Christmas Season. 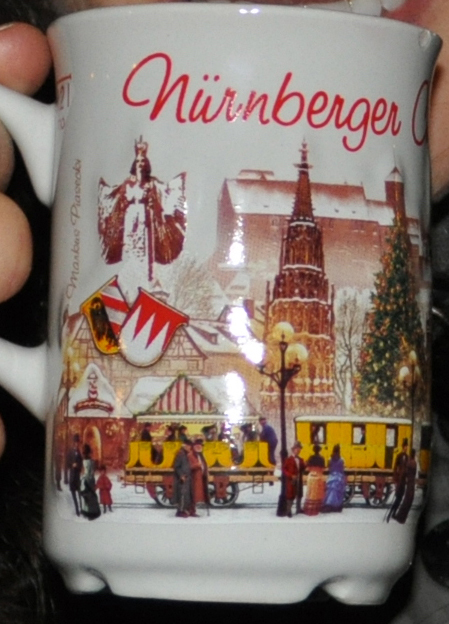 K and I arrived in mid-afternoon and strolled around the Christmas Market in Market Square (our fourth of the trip). We indulged in more glühwein (warmed mulled wine) along with crepes filled with Nutella and banana—a popular choice among us market-goers. We also walked the rampart wall that surrounds Rothenburg. This covered, narrow walk offers great views and an interesting perspective on what it was like when the wall was actually used to protect the city from siege. P.S. They don’t serve burgers. Bürger means citizen/townsman. Our visit to Rothenburg was short…but enjoyable. We finally arrived in Nuremberg (after another delay at Brussels-Midi and another cancelled train) at around 4pm. We quickly settled into our hotel so we could check out the city before it got too dark and cold. Each year Nuremberg hosts one of Germany’s most famous Christmas Markets. Nestled in the city walls of the Altstadt (old town), it spans several blocks making this market the largest one we wandered through during our trip (this one being our third). 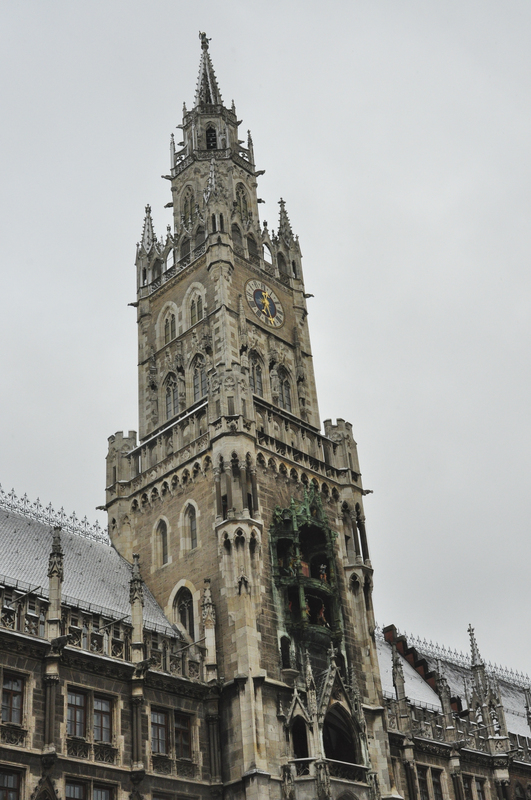 We walked around the Altstadt to view the medieval architecture that makes this city so attractive to tourists. Due to our travel woes, this Nuremberg sight-seeing walk was mainly done in the dark, but we made the best of it. Unfortunately, since our trip here was cut short, I have no notable eats & drinks to list. Although, the food at the Christmas Market was some of the best we’ve had.